A swarm at the farm? Not quite. The bees did try to swarm, but we made changes to the colony before they did. If you look at the picture you can see a ‘queen cell’, hanging from the bottom of the frame. Inside these special cells bees raise queen bees, not often more than a handful in a hive each year. The queen lays an egg in the cell and the hatched bee egg gets better food, more space and instead of becoming a worker bee a larger queen bee is produced. Bees produce these queen cells just before they swarm, so we knew the bees wanted to swarm, and that soon, in about a week, a new queen would hatch from the cell. But, because queen bees, without exception, will not tolerate another queen in the hive, one of two things must happen*. Either one queen kills the other or the old queen leaves the hive before the new queen hatches, taking many thousands of bees with her – the swarm. We don’t want all those bees to leave because it’s all those extra bees that might get us some honey – they are our honey getting workforce. So, to prevent swarming, we did the following. 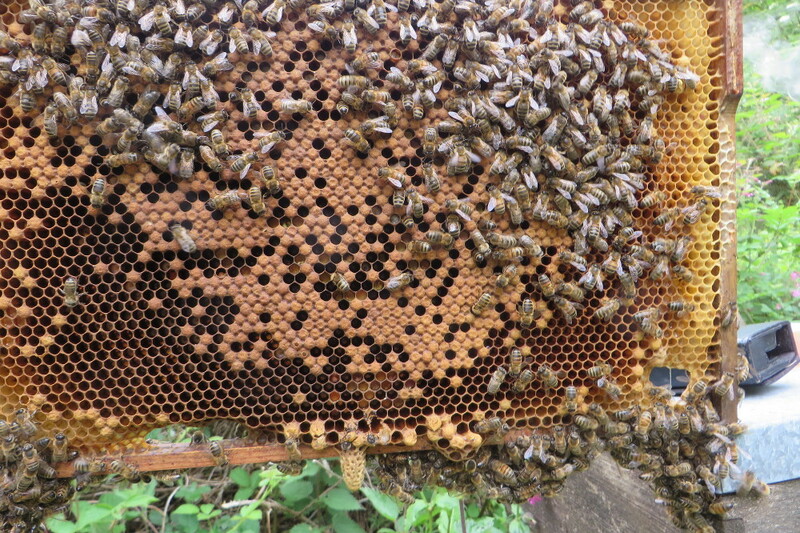 We took the frame and queen cell, plus some new frames, put them into a new hive, shook in many thousands of bees from the original hive and took them to a new home (so, in a way, we did let the bees swarm but under our control). Here that queen should hatch, mate, build up the new colony and later we will either let her continue or bring the new colony back, to ‘unite’ it with the old one . We would then still have one big colony for when we get most of our honey – in July. *very occasionally you can find mother and daughter queens in beehives (a process called ‘supersedure’) usually in the autumn when bees replace the queen but swarming would be impossible.